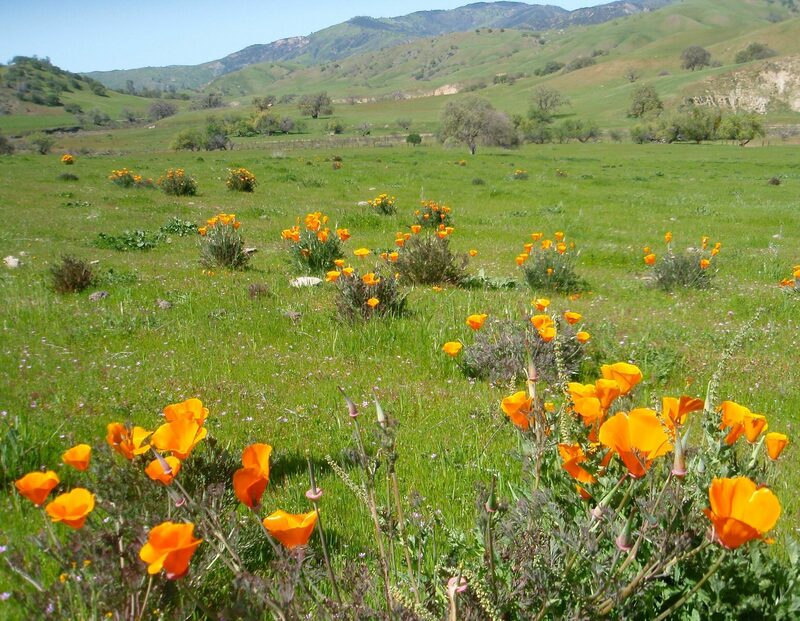 Theodore Payne Foundation’s Wildflower Hotline produces a weekly update during the spring wildflower season. 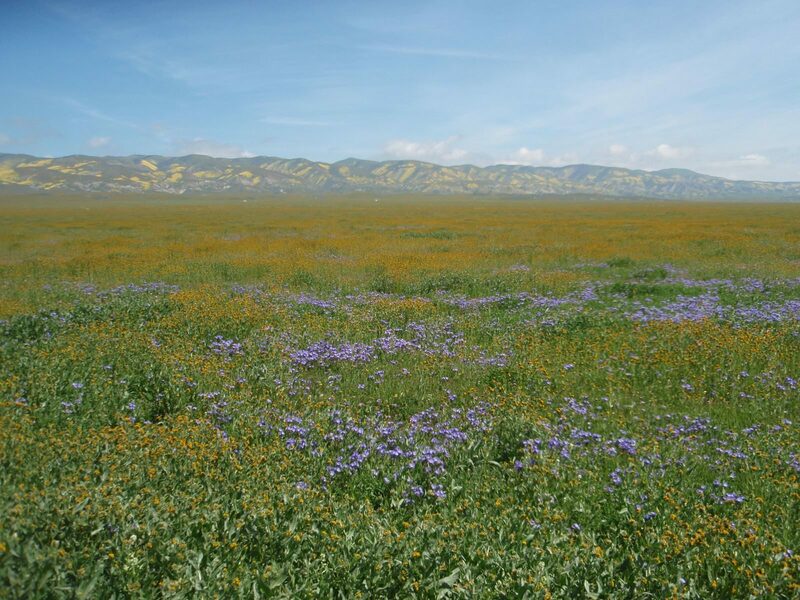 BLM’s Carrizo Plain National Monument site and summary of the wildflower seasonality. The Nature Conservancy was influential in establishing the monument. 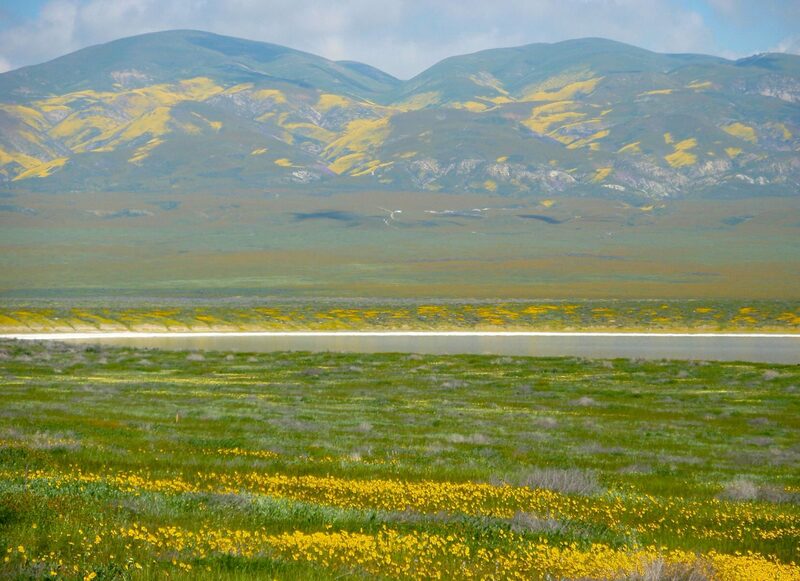 Friends of the Carrizo Plain. Section Six passes through the Ventana Wilderness on the Arroyo Seco-Indians Road. VentanaWild’s Trail Condition Report and the Big Sur Trailmap are excellent resources. 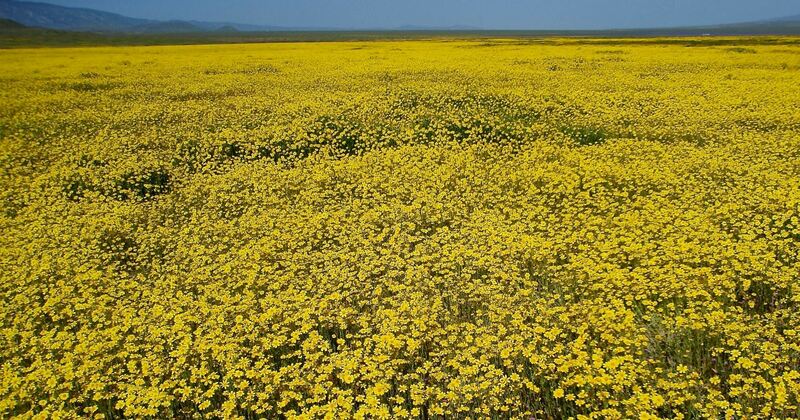 During mid March to mid or late April following a wet winter the Carrizo Plain National Monument (CPNM) is one of the best wildflower displays in North America. We had been to the monument, but never during peak season, and we wanted to see it in its full glory. 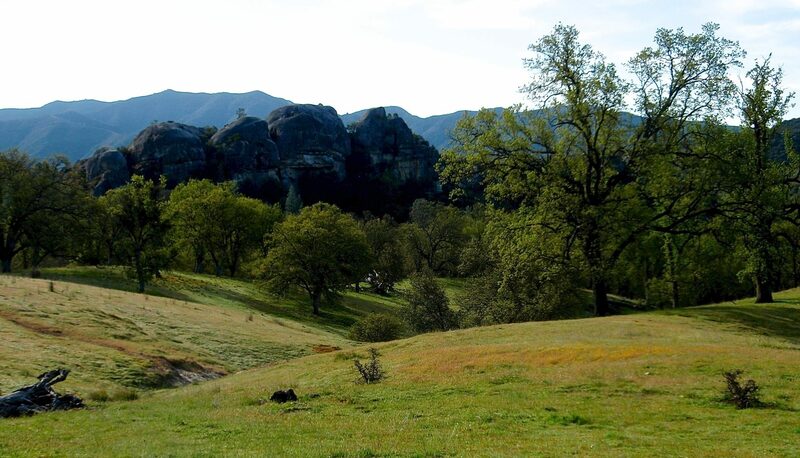 We designed this route to visit the monument, cross the Ventana Wilderness on the spectacular Arroyo-Seco Indians Road, and stay on very quiet rural roads in beautiful California Oak Savanna habitat. We have written this report with full details as a Route Guide because we believe this is a great cycle route for about one month each year. Very high quality dirt road, which would be fine on regular touring tires without suspension. But we’re on fat tires with front suspension, so it’s all very cushy. Camp #1, USFS La Panza Campground. Day 1 stats: 51 miles (7 on dirt), 3965′ gain. temps 35-65 and clear. 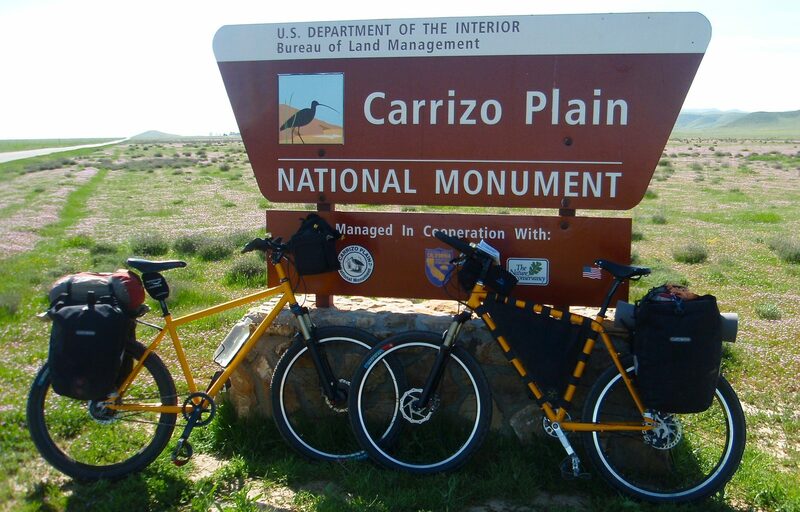 Day #2 morning, the northern boundary of Carrizo Plain National Monument. Created in Jan 2000, by proclamation by President Clinton during his final week in office, after many years of groundwork by The Nature Conservancy. 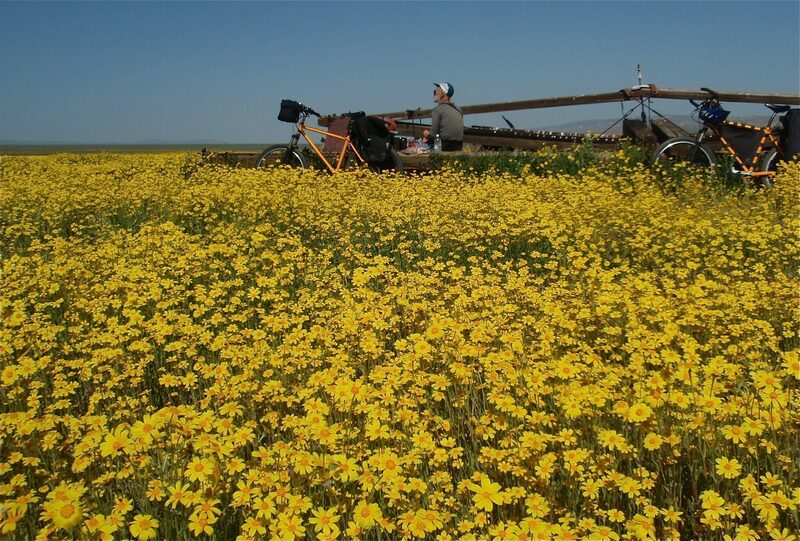 Carrizo is a stellar place for 4-8 weeks each spring; we are visiting at the very early stage of the flower show. From here we’ll ride a ~70 mile dirt road loop through the monument. Isolated, desolate, terrific sense of space. I love this place. 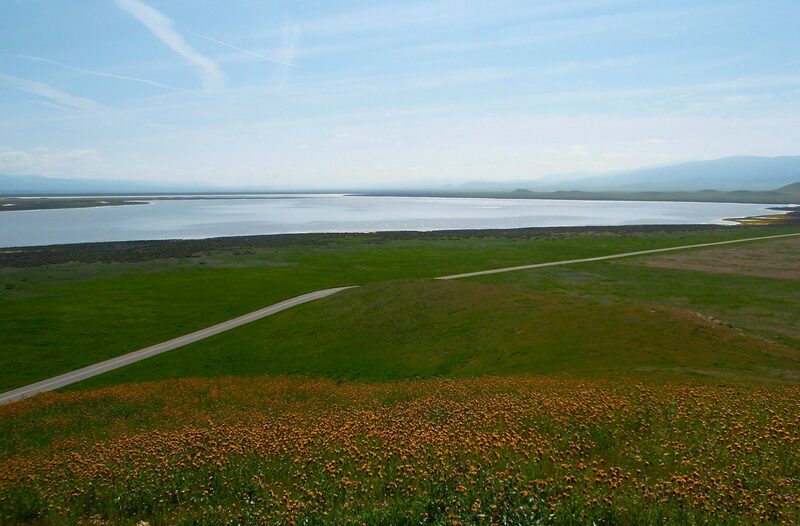 The valley at the core of Carrizo has no outlet and is there is a seasonal salt lake. Everything you can see in this photo is in the National Monument. We’re looking south here, and the monument is essentially this entire valley plus the land up to the crest of the mountain ranges to the east and the west. ~35 miles long and ~15 miles wide. On Cholame Valley Road, riding north along the San Andreas fault toward Parkfield. Our first fields of poppies. Morning #5, crossing Parkfield Grade. Lovely oak savannah ranchland. Reminds me of Henry Coe State Park. Morning #6. More oak savannah ranchlands along the San Andreas Fault. Day #7, out of the hills and into the Salinas River valley. SE of Soledad, we head up the Arroy Seco River valley. This is one of the slides on the Arroyo Seco – Indians Road that was never repaired, thus the closing of the road to vehicles. Ceanothus is blooming. Riding south out of Los Padres NF and into Fort Hunter Ligget, for 20 miles of riding on a paved road with no traffic, riding through Valley Oak Savannah on the military base. We were out at the start of the wildflower season before things were fully blooming, and we still had a great show. 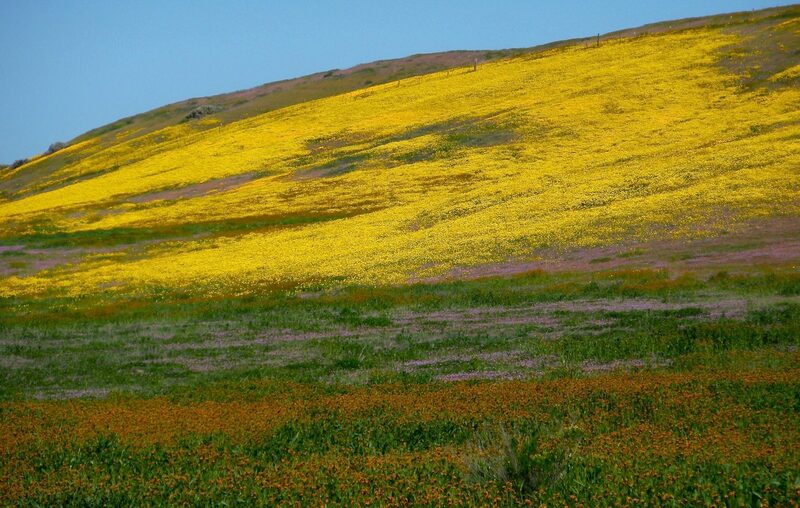 Flowers filled the valley floor and surrounding hillsides. The grass was green and the big oaks were flushing their leaves. Only three towns in 450 miles, so even though we rode primarily on paved roads, it’s pretty isolated. Only ~15 miles of busy roads (mostly in the three towns) and another ~25-50 miles of moderate traffic. The vast majority of the route had fewer than five cars per hours. Easy access from home (SF Bay Area), and the loop itinerary made logistics easy. The weather was perfect (no clouds, and 35 to 70 degrees every day). California weather is dang predictable. 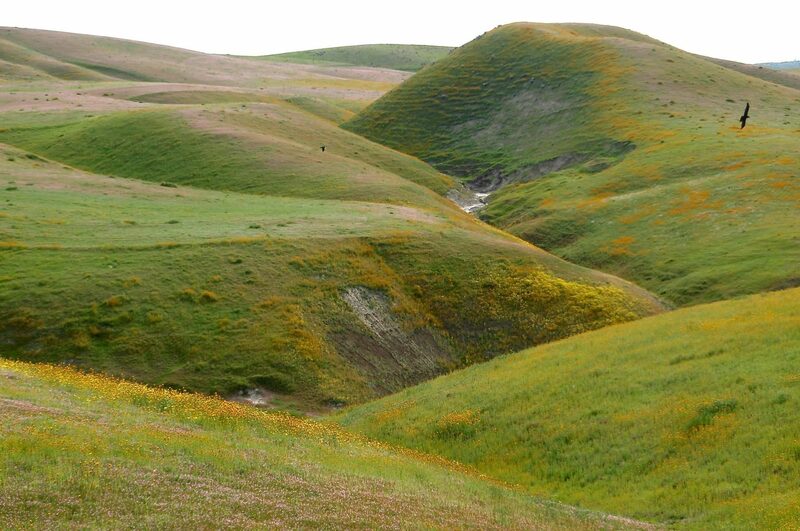 My favorite areas: Carrizo Plain National Monument, and the Arroyo Seco-Indians Road in Los Padres National Forest. 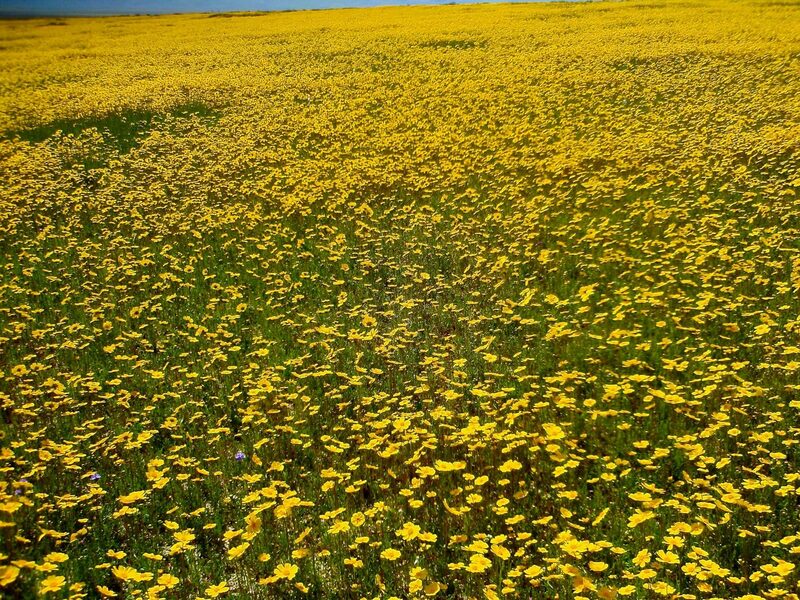 We had been to Carrizo a couple of times, but never during peak wildflowers. 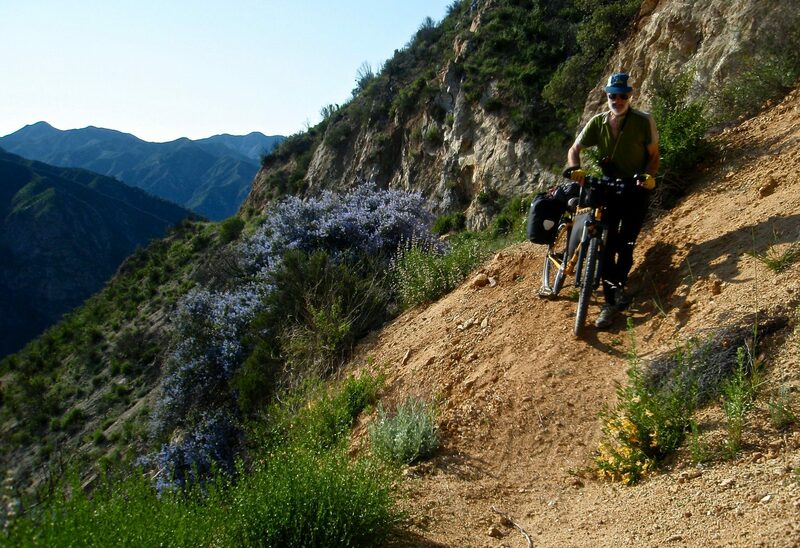 The place is perfect for dirt road bike touring and bikes are ideal for viewing massive wildflower displays. You can ride as slowly as you want and it is easy to stop as often as you like. 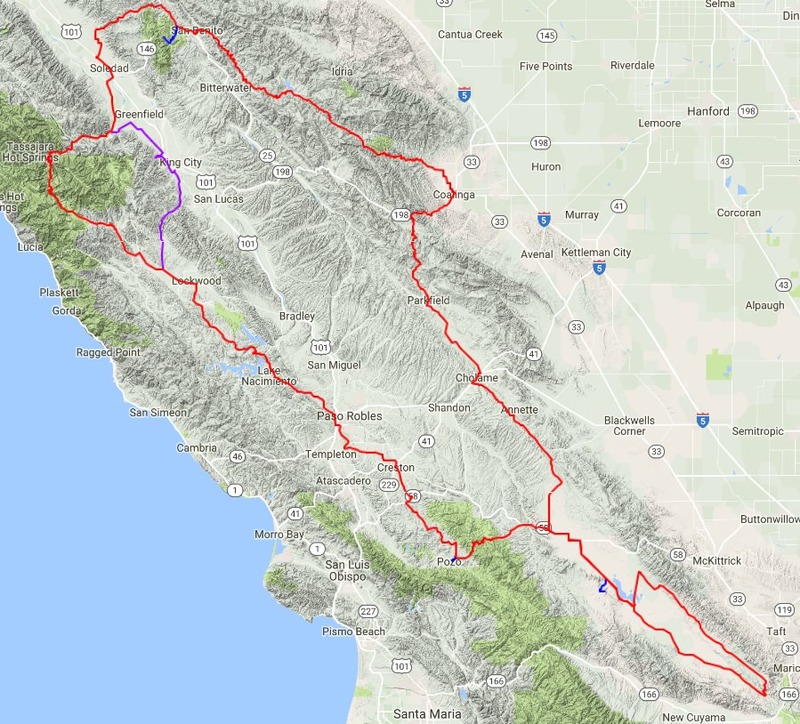 Add to that a chance to ride the central California backcountry on mostly quiet roads and trails and this was a perfect trip. Except for the part where I fractured my radius in a crash soon after we started the Indians Road section, which made for a couple of days of painful riding. ~106 miles on dirt roads. 91 of these miles are high quality graded surface. The remaining 15 dirt miles are on the Arroyo Seco Indians Road, which has been closed to vehicles since 1994, and includes a few short hike-a-bikes over very steep landslides. ~20 miles on paved roads with appreciable amounts of traffic, primarily through the three towns. ~318 miles on very quiet, rural paved roads. Three towns en-route: Paso Robles, Coalinga, and Soledad. 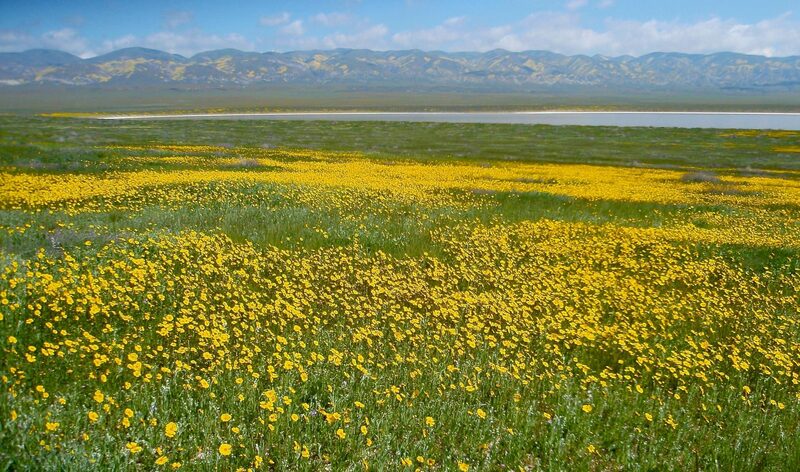 The southern portion is dominated by the lovely Carrizo Plain National Monument. 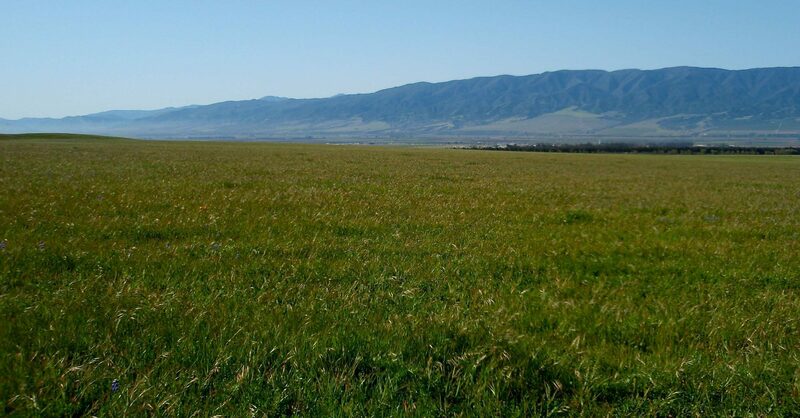 The eastern portion follows the San Andreas Fault north through the beautiful isolated oak ranch lands of the Gavilan Mountain Range. Pinnacles National Park is at the northern end of the route and is best known for it’s California Condors, caves, and wildflowers. 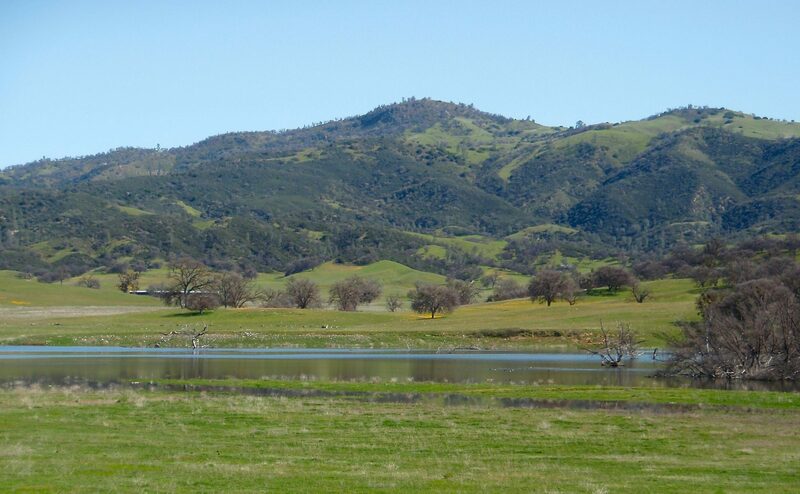 The western side of the route includes remote riding through the Santa Lucia Mountains of Los Padres National Forest and Fort Hunter Liggett. All parts of this route are excellent. One could start anywhere and ride in either direction. Our route description arbitrarily starts in Paso Robles and goes counter-clockwise. 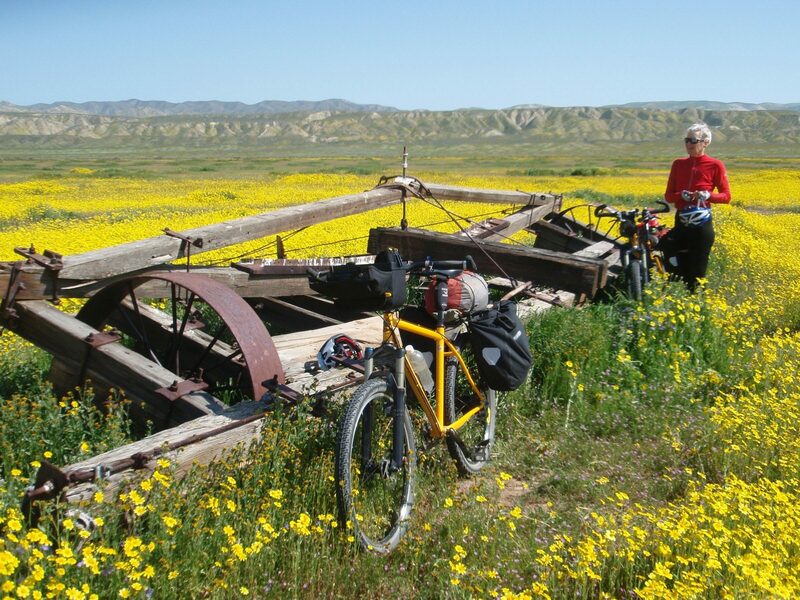 By far the best time to ride this loop is when the wildflowers are blooming between mid-March and late April. 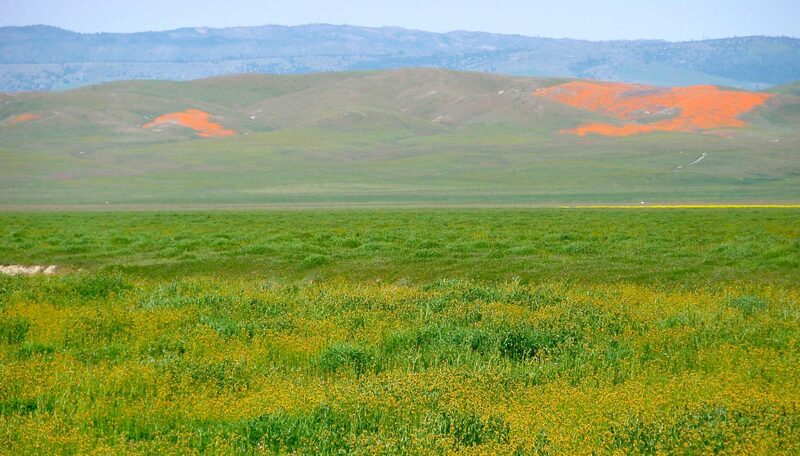 The BLM has an excellent description of the timing of the bloom. Winter is not good because the dirt roads in the rainy season will be sticky when wet. March and April are on the shoulder of the rainy season; rain is still possible, but chances are fairly low and decreasing as you get later into April. Summer is way too hot and dry. In October and November weather would be pleasant, however, the the entire route, especially the loop through CPNM is far less interesting when not in bloom. If at all possible, the timing should be determined using information from the Wildflower Hotline. There is Amtrak service to Paso Robles. There is Greyhound service to King City and Paso Robles. The USFS and BLM manage much of the western US and rough camping is permitted anywhere. 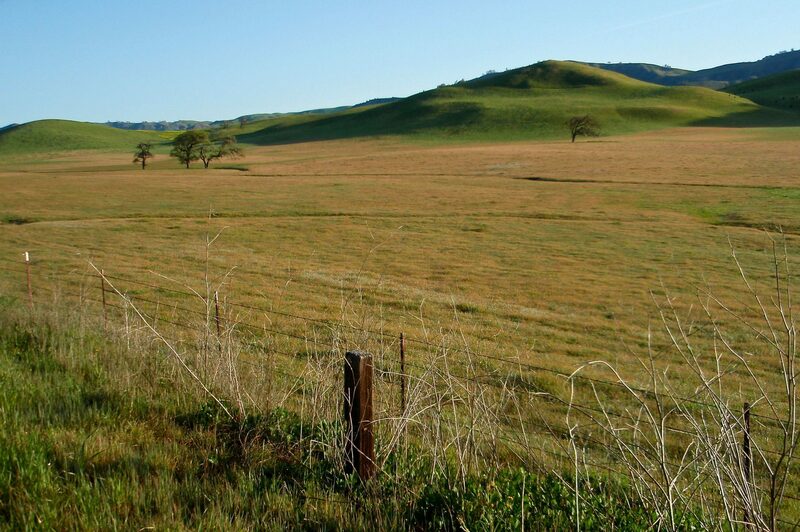 However, most of the land in this part of California was distributed to private landholders when California was controlled by Spain and subsequently Mexico, and as a result there are long stretches of private ranch land where camping is not permitted. We have included notes about camping options in this article and in the waypoints in the CalTopo map. The California State Auto Association map “Coast and Valley, Bay Area to Southern California” shows all roads on the route and is the best overall map to use if you can find it. The National Geographic Trails Illustrated Map Big Sur, Ventana Wilderness is helpful but not absolutely critical. The CPNM maps can be downloaded from the BLM website. The monument’s visitor center is not open every day, so print the maps at home before you start. Route Description section numbers correspond to the numbered lines on the CalTopo map. Paso Robles Walmart to the junction of Carrisa Highway 58 and Bitterwater Road. 59 miles, up 4400′, down 3100′. 49 miles paved. 10 miles graded dirt, high quality when dry. Most Walmarts allow long-term parking in their lots and we have twice left cars during multi-day bike trips. The Walmart manager told us that the Paso Robles Walmart did not own its lot, and city ordinance does not permit overnight parking there; the manager warned us that if someone complained about the car it could be towed, even though Walmart doesn’t care. We parked there for the duration of our trip without any problems and it appeared that other people were doing the same. Stock up on food before leaving Paso Robles. There is one restaurant on Section #1, and two restaurants on Section #4 but the next store on the route is not until Coalinga on Section #5. The Pozo Saloon, 1.3 flat miles off route at mile ~37.5, might be open only on Friday through Sunday. They have outdoor afternoon concerts during dry season which could generate traffic on the otherwise quiet roads in the area. (805) 438-4225. 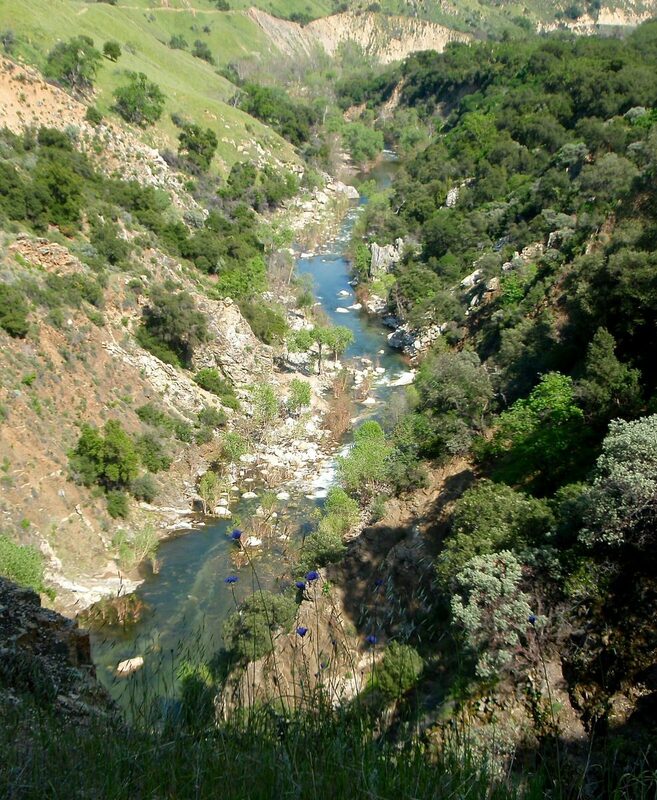 The route is in Los Padres NF between mile 41 and 49. 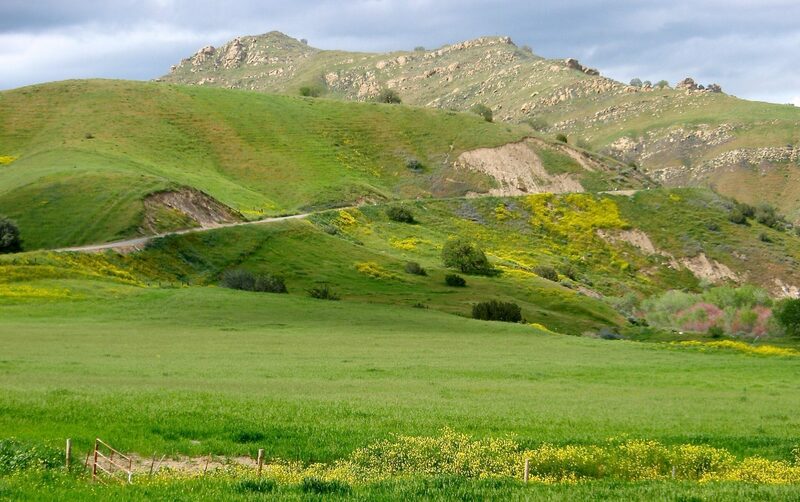 You can camp anywhere in the Los Padres National Forest, however much of it is hilly and brushy. La Panza is an official USFS camp at mile ~48, with no piped water, but it did have in a small flowing creek when we were there. It’s shady and pleasant, but has no view as it’s down in a valley. Another camping option is old the Queen Bee USFS Campground, which we didn’t visit. This campground is marked on the USGS topo but is no longer listed by the USFS as a campground. 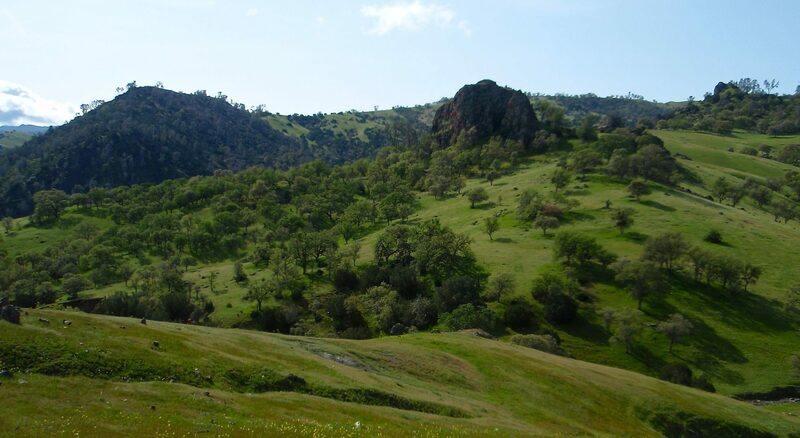 We found an old description: “the small Queen Bee Creek and passing two flowing springs and a couple of shady campsites along the creek.” It is 0.9 miles SE off-route from the Pozo Rd / Queen Bee Rd junction at mile 49. From the topo map and the satellite image, Queen Bee Campground might be a good place to camp. Both La Panza and Queen Bee camps are likely to have OHV traffic on weekends. CPNM Loop, starting and ending at the junction of Carrisa Highway 58 and Bitterwater Road. 106 miles, up 2400′, down 2400′. 45 miles paved. 60 graded dirt, high quality when dry, impassable when wet. 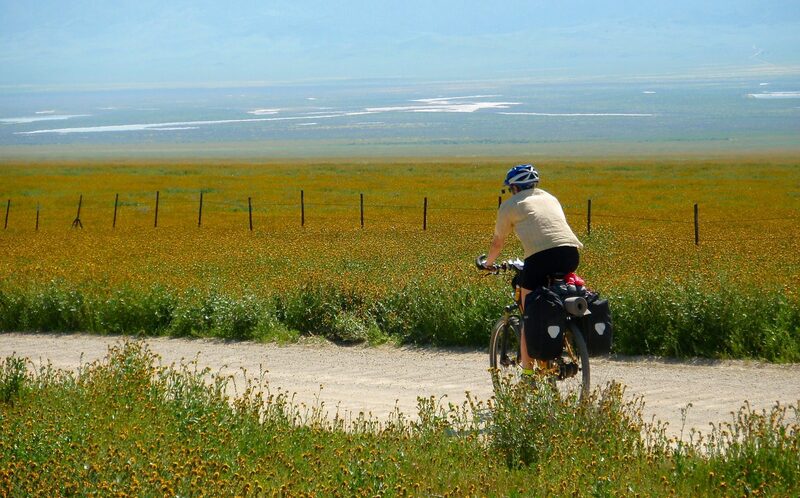 The Carrizo Plain has a great sense of space, fascinating geology, astonishing flowers, solitude, and excellent dirt-road cycling. It is one of the least visited units in the National Park system. There are no shops or restaurants in this section. The only water spigot is on the outside of the California Valley Community Service District Center, at mile 8.5 (and again at mile 97.5). It has picnic tables, porta-potty, grass, and a tiny library open on Wednesdays. California Valley has no other services or stores. The CPNM Visitor Center is a kilometer off route at approximately mile 21 (and again near mile 85) of this section, where the route forks to start the loop. It is not open every day and there is no water available. The only source of water on route in CNMP is at the KCL campground. Confirm water availability at KCL prior to your trip. 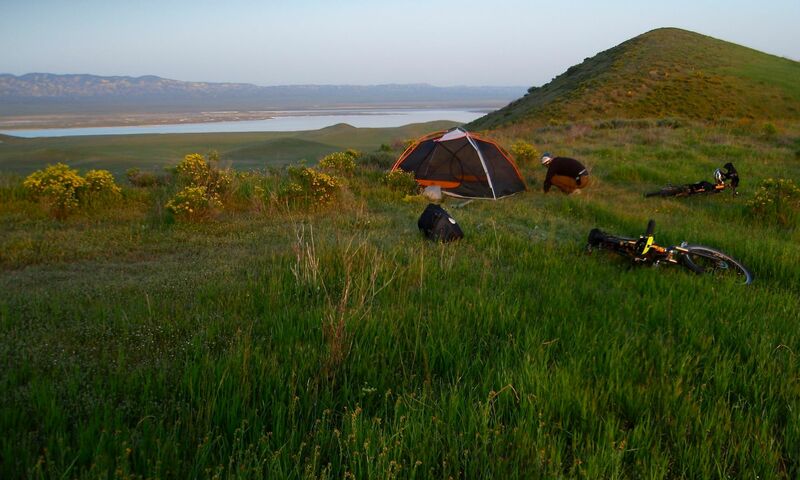 There are great rough camping opportunities throughout the monument, however the rules about camping inside the CNMP are ambiguous so use your discretion if you camp outside a designated campground. There are side roads off the route that give access to different wildflower habitats and it is well worth taking the time to explore. Wallace Creek is an interesting geology stop shown on the CNMP map. From the junction of Carrisa Highway and Bitterwater Road to Parkfield. 50 miles, up 1500′, down 2000′. All paved. This is a fantastic day of paved road riding. Very quiet roads, and great wildflowers if the season is right. The route includes two miles on a fairly busy stretch of highway 41/46 (miles 52.5 to 54.5), but the road has a good shoulder. There are NO STORES. 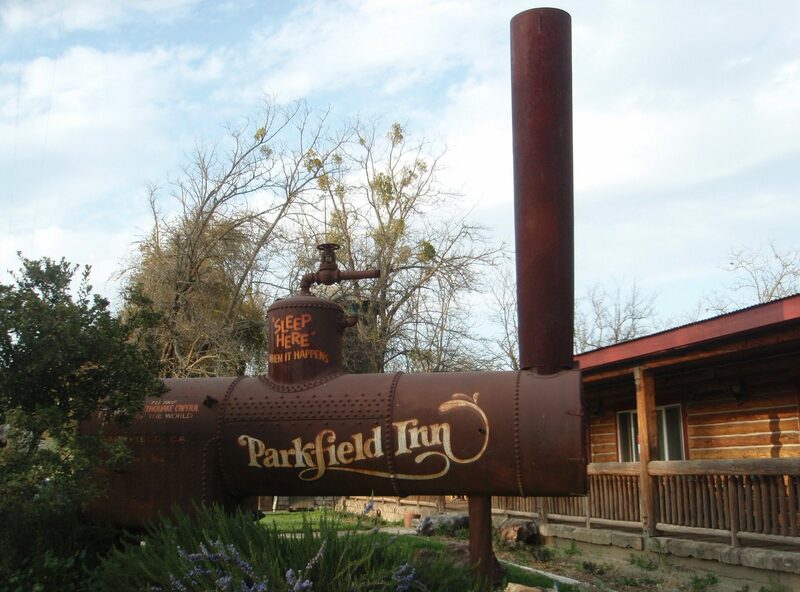 The only public sources of water are at the Jack Ranch Café (mile 32) and Parkfield. There are seasonal streams where you might be able to get water. Jack Ranch Café and James Dean Memorial is at mile 32. 805/238-5652, 7 AM – 7:30 PM daily. James Dean died in an automobile accident near the cafe. Cholame Valley Wetlands at about mile 37 is a tiny pathetic wetland, but did have a snipe and avocets and ducks when we were there. There is no public land in this section. You could probably stop and ask a rancher for permission to camp if you don’t want to continue to Parkfield. Parkfield is not a town and has no shops. There are a cluster of USGS trailers, plus the V6 Ranch/Café/Inn. Rooms start at $89 per night and includes self-serve continental breakfast. The Café is open Thursdays through Sundays. We were given permission to camp in the yard next to the restaurant/lodge, with toilet but no showers. The bathroom is inside the “living room” in the Inn, where there is also a small kitchen. It is worth calling them in advance to confirm hours and availability of camping or lodging. Very friendly people in a beautiful oak valley. 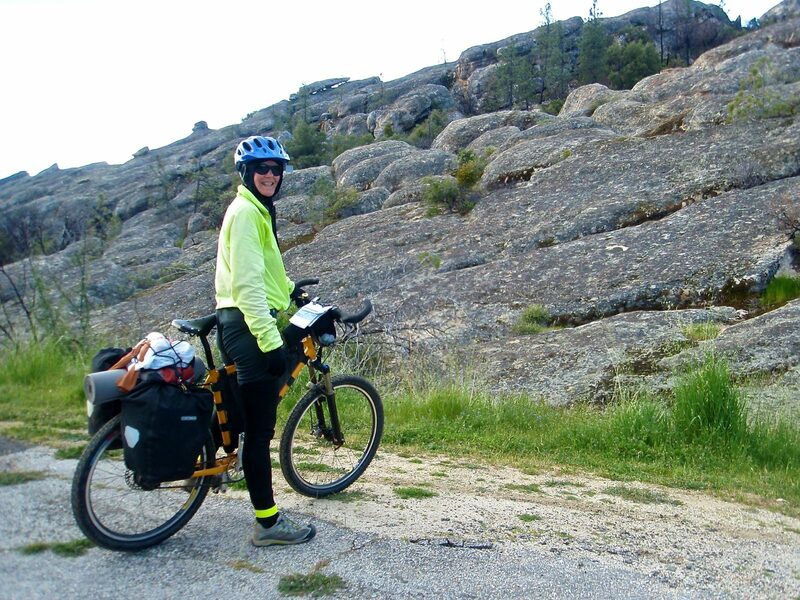 From Parkfield to the Pinnacles National Park junction. 95 miles, up 5700′, down 6100′. About 10 miles of high-quality dirt road. 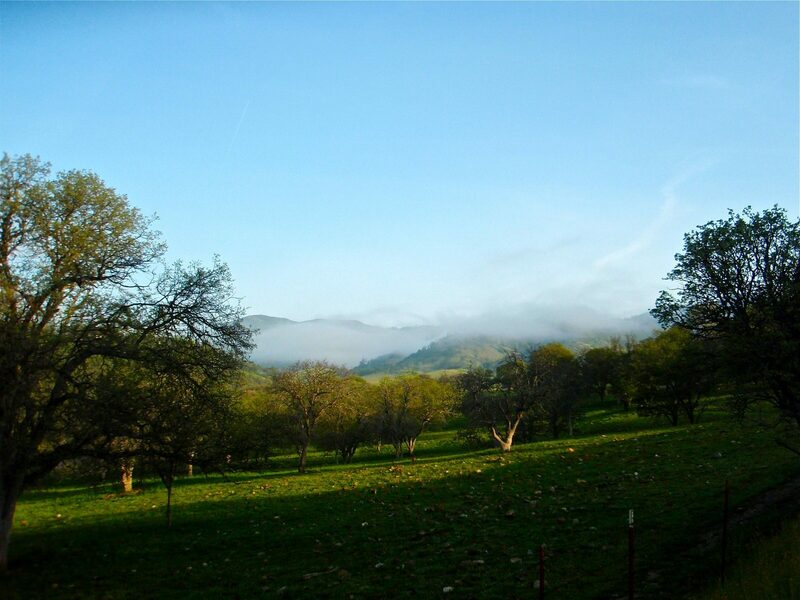 The first 18 miles is on Parkfield Grade, a quiet road passing through beautiful private oak savanna ranch lands. About five miles is graded dirt and might be sticky when wet. Miles 27 to 33 are in the Central Valley town of Coalinga, population 15,000. It is not particularly attractive, but it’s got a big grocery store, laundromat, motels, fast-food and pizza shops, and a library. Other than the town of Coalinga, this section has no services, stores, or public water sources. You’ll pass by the Benitoite Gem Mine tourist attraction. That site is of little interest, but the roadside sign with info about Benitoite may intrigue gem aficionados. There are five campgrounds between Coalinga and the end of this section. The first on this list has no water and we do not know the status of water at the four BLM campgrounds. Mile 46: Los Gatos Creek County Park has camping facilities, a baseball field, a large group picnic area, but no water. The campground is nothing special, but it’s not bad. Probably best to avoid it on weekends, when it might well have noisy OHV riders. We camped there mid-week and there was just one quiet RV there with us. Mile 55: BLM’s Condon Peak Recreation area is at he top of the pass. Mile 64: BLM’s Clear Creek Management Area Oak Flat campground. Mile 67: BLM’s Laguna Mountain campground. Mile 68: BLM’s Sweetwater campground. The old mine in BLM’s Clear Creek Management Area is a Superfund Site, with asbestos. Part of that BLM area is closed to all users. If you are cautious about health issues, you might want avoid taking surface water from the creeks draining that region. The Beaver Dam Cal Fire Station is at mile 75. It is likely closed in the spring, but has an outdoor spigot that should be available for water. At mile 76 the route turns north off the Coalinga Road onto beautiful Old Hernandez Road, which is even less crowded than the Coalinga Road. Old Hernandez Road runs along the San Benito River. About 5 miles of Old Hernandez Road is well graded dirt/gravel; it has one river ford that might be high after a rain. This section ends at the junction with the road to Pinnacles National Park. There is a full service campground and small store with limited hours two miles south. 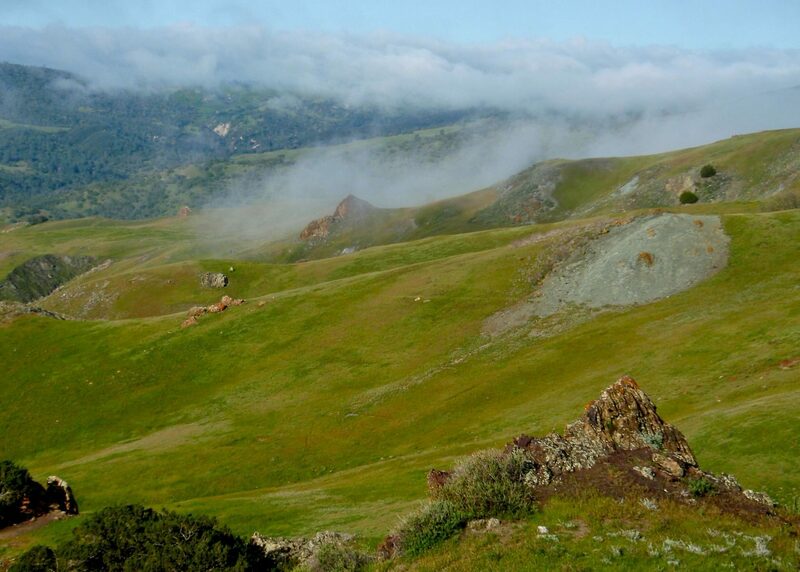 This is the last public land until you reach Los Padres National Forest, 50+ miles further on. Unless you plan to stay at a motel in Soledad, this is a good place to stop; the campground is very popular on spring weekends and spring break week, and if you plan to stay here you should try to avoid weekends and/or reserve in advance. The park itself has some very nice hiking trails, so you could take time off the bike and go walking instead. The park trails are not open to bicycles. Pinnacles is one of just a few sites that have wild-flying California Condors. 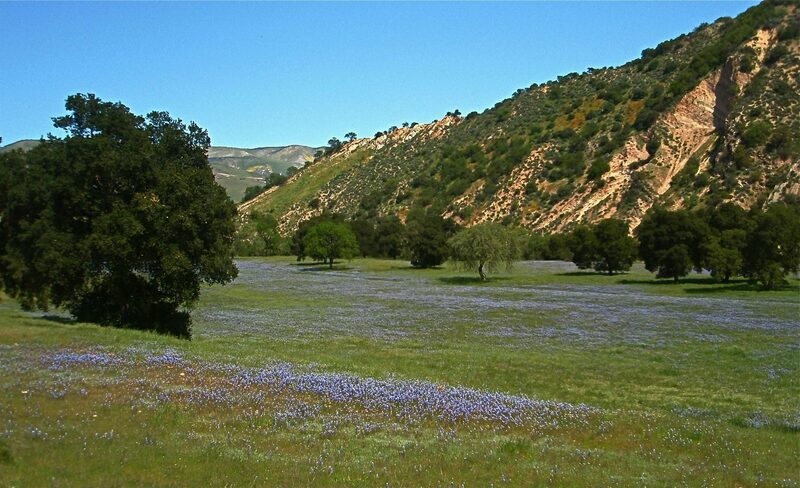 It is known for great wildflower displays, and the wildflower hotline usually has info about Pinnacles. From Pinnacles junction to Los Padres junction. 36 miles, up 1600′, down 2500′. About 11 miles of high-quality dirt road. At mile 4.5 turn left onto dirt La Gloria Road, which may have no sign. The turn is just before a small creek, and just before a ranch house on the right side of the road. Off-route less than one mile north of the junction is a Cal Department of Forestry office where water should be available. La Gloria Road from mile 4.5 to mile 16 is a beautiful high quality graded dirt road. At mile 17 turn left onto paved Camphora Gloria Road, and take that to highway 101 at mile 22. This road passes through fertile crop-land. From the junction of Camphora Gloria Road and 101, we took 101 south ~2 miles (1 exit) to Soledad. There is a dirt farm track on the SW side of 101 that you might be able to follow instead of getting onto the highway, although these farm tracks are often fenced. Soledad is a working agricultural town, not quaint or attractive, but it has groceries, library, motel, and so forth. When you leave Soledad, the only way across the Salinas river is via 101, so you need to get onto 101 again and travel south ~1 mile to the Arroyo Seco Road exit. Stay on Arroyo Seco Road for the rest of the section. From Los Padres junction to Jolon. 50 miles, up 4800′, down 4300′. 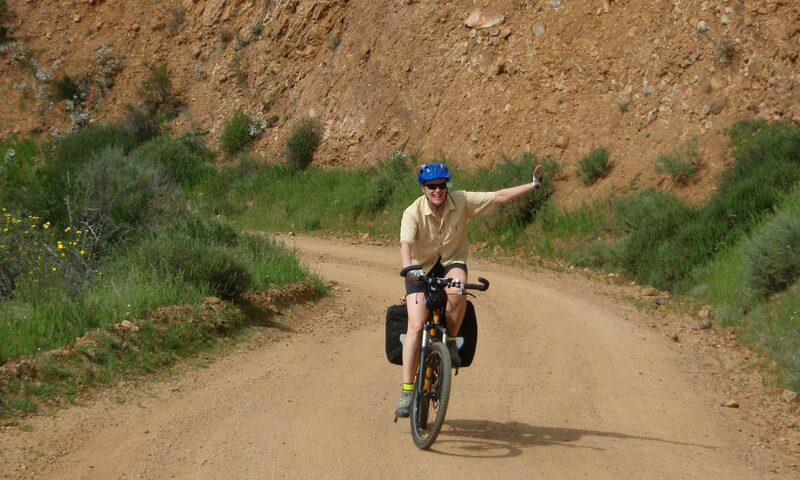 15 miles is rough dirt road, including several hike-a-bike sections over old steep landslides. This section begins at a junction where you choose between two alternatives. 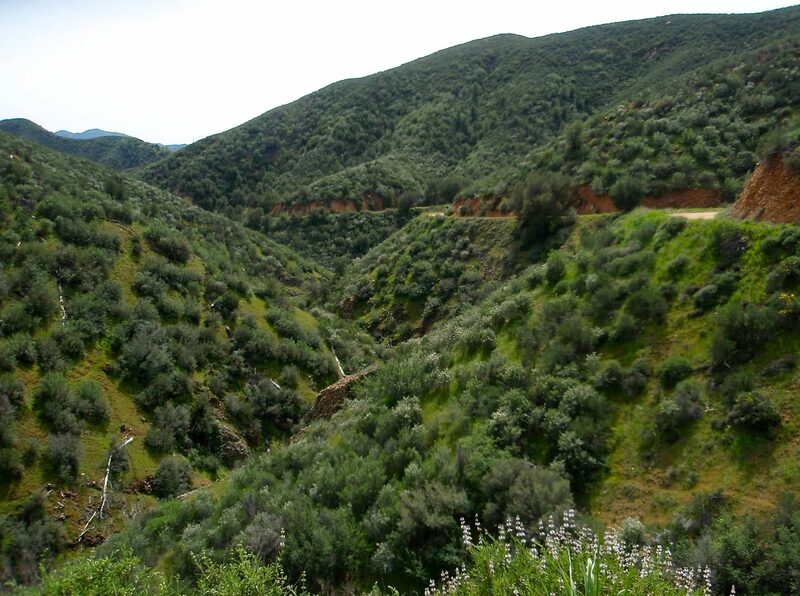 The western route passes through the wild a remote section of Los Padres National Forest via the old Arroy Seco-Indians Road and is the preferred route. The region burned in the 2016 Soberanes fire and although the old road forms the boundary of a post-fire closure zone the road itself is still open to hikers and cyclists. At mile 12 the Arroy Seco Road crosses a bridge over the Arroyo Seco River; there is a USFS day-use area with bathrooms, water spigot, and access to the river. Just west of the bridge is the USFS Arroyo Seco Campground. You could camp here, but there is a reasonable chance it will be noisy and there is excellent rough camping further on. There is trailhead parking in the area and one could start and end the trip here instead of in Paso Robles. At mile 12.5 there is a gate across the road and for the next 15 miles the route follows the old dirt Arroyo Seco-Indians Road. The Arroyo Seco-Indians Road, along with CPNM, is the most scenic portion of the trip. 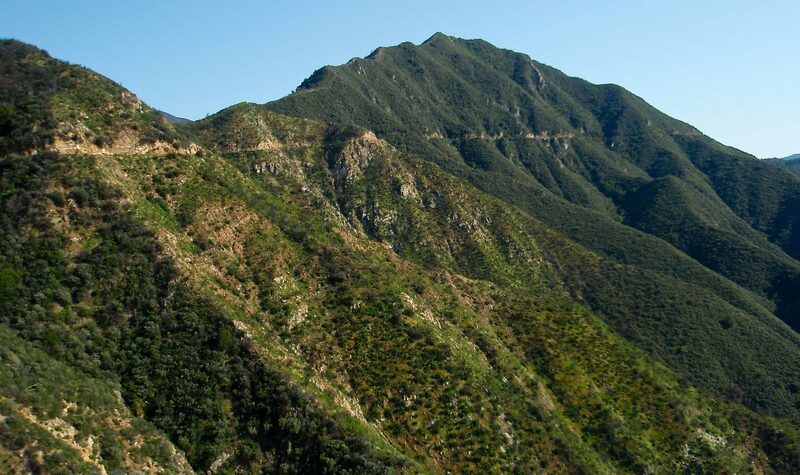 The Arroyo Seco-Indians Road is closed to motor vehicles but open to hikers and bicycles. It is a non-wilderness corridor passing through the stellar Ventana Wilderness. It has been closed to vehicles since 1994 and has a complex history. By dirt road standards, this is a rough ride. By single-track standards, this is relatively straight-forward riding. We mapped an alternative for use by cyclists who want to avoid the Arroyo Seco-Indians Road; we have not ridden the alternate route and cannot offer a detailed description. In March of 2017 we hiked the road from Arroyo Seco Campground to Escondido Campground to study conditions after the huge 2016 fire and the record winter 2016-2017 rainstorms. 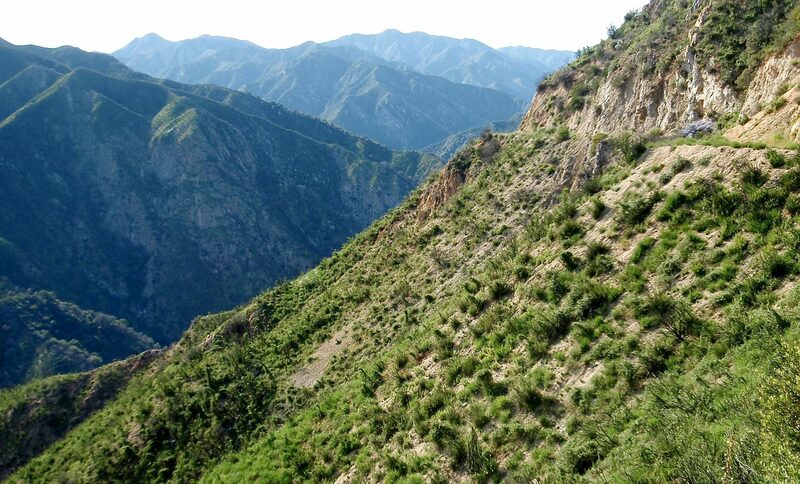 Prior to the summer of 2016, much of the Arroyo Seco Indians Road was rutted, had encroaching vegetation and had been covered by several slides. During firefighting effort for the huge Soberanes Fire, crews cleared and graded most of the road. A 1.5 mile stretch of the road was not accessible to bulldozers due to old slides, and it remains rutted, has some vegetation growing in the roadbed, and has numerous easy short hike-a-bike obstacles. There are two 2017 slides outside of that 1.5 mile corridor that require an easy hike-a-bike as well. The road parallels the Arroyo Seco River, but it is high above the river in steep terrain, and the river is not reasonably accessible except as noted on the CalTopo map. 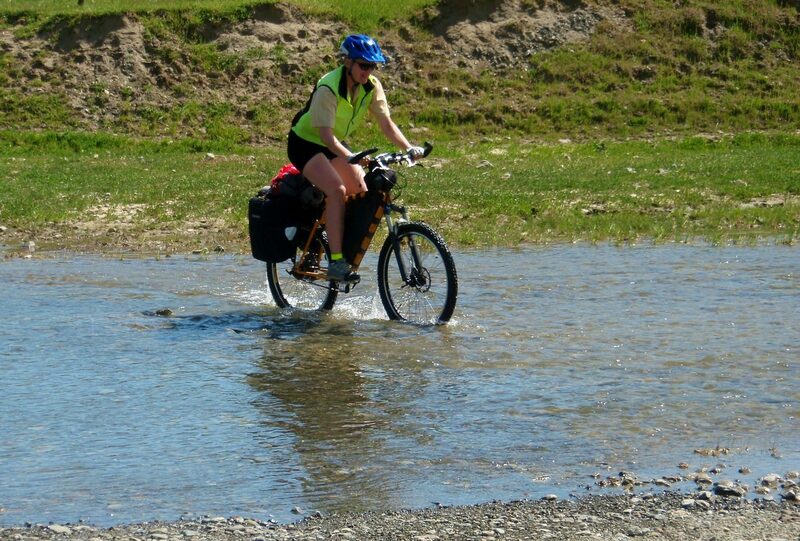 If you ride in the winter or spring, there will be numerous springs and creeks, so water is readily available along the road. In late summer or fall, water will be limited, although some of the springs flow year-round. Camping is permitted anywhere, although much of the terrain is mountainous and in many areas the only level place for a tent would be on the road-bed. The most scenic and remote camping is in the hanging valley at about 2750 feet between miles 21 and 22. A small seasonal creek crosses the road in this valley and there is a perennial spring nearby, marked on the CalTopo map. There are foot trails that branch off of the Arroyo Seco-Indians Road, and you could take time off for a hike. 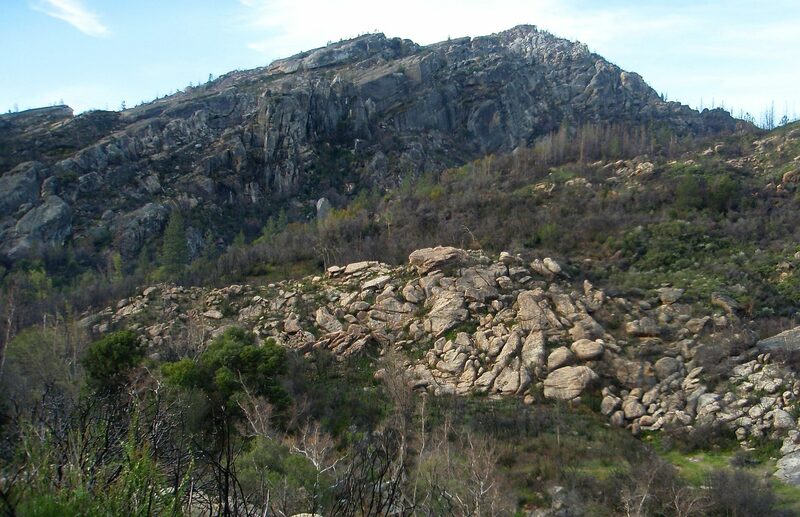 Ventana Wilderness is a special place, but hiking there can be a real challenge due to steep terrain, dense vegetation, and decades of inadequate trail maintenance. Many trails shown on the topo maps are difficult or impassible. If you are planning to do any hiking, get a copy of the Trail guide to Los Padres National Forest, Monterey Ranger District, and study Ventana Wilderness Alliance’s trail conditions report. There is a permanently closed gate at mile 24, blocking vehicle access from the south. 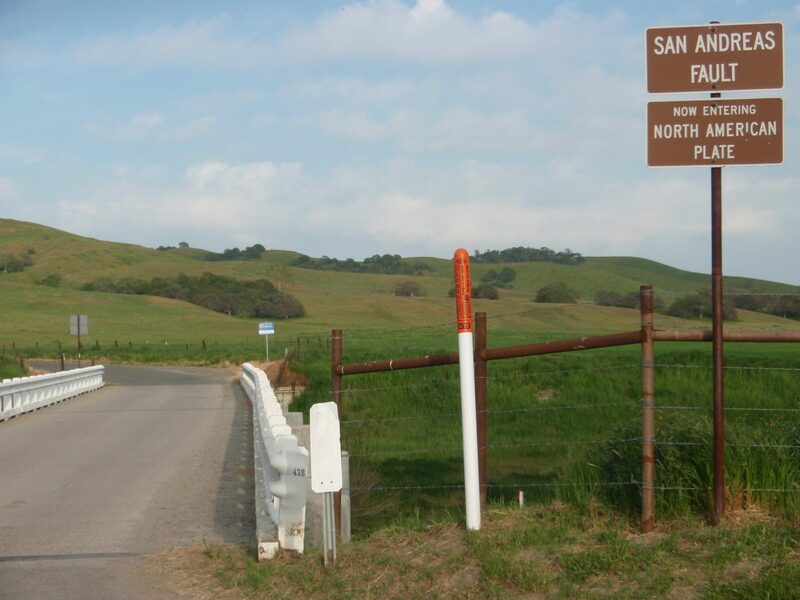 There is second gate at mile 27, seasonally open to allow vehicle access to USFS Escondido Camp at mile 24. USFS Memorial Park campground is located at mile 27. The road south from Memorial Park is paved. For 18 miles starting at the USFS border at mile 32, the route travels through Fort Hunter Ligget on a beautiful quiet paved road. You are required to carry photo ID (passport or drivers license) while on this military property, and you are not permitted to camp or leave the designated roads. History buffs might find the history of this valley interesting, and there are two historical landmarks at mile 45 that are worth visiting. The Hacienda Milpitas, designed by Julia Morgan for William Randolph Hearst when he owned much of the property is now a small hotel. There is an outdoor spigot at the Hacienda, but no food (the restaurant closed in 2005). Rooms from $50 per night. The Mission San Antonio De Padua, built in 1771, is ~1/3 mile NW of The Hacienda. This section ends at the military entrance gate at the junction with Jolon Road. It is at this gate where you would be required to show your driver’s license and proof of vehicle insurance if you were entering the fort via the normal route. From Jolon to Paso Robles. 46 miles, up 3100′, down 3400′. All paved. This section is routed through private ranch land and we are not aware of any campgrounds. Mile 22: Bee Rock Country Store and Pizzaria, which we believe is closed now, either permanently or for remodeling. Mile 30: Oak Hill Market is a full service grocery store, open daily from 7am to 9pm. As you approach Paso Robles, traffic increases to annoying levels for the first time on the trip, however the shoulders are generous and are often marked as a bike route. Great writeup, thanks. I drove and car-camped much of your route last spring, without knowing it. A possible longer alternate to your LPNF alternate route (Jolon Road) could take riders over the BLM Williams Hill Recreation Area. It has one free, waterless campground near the top of the mountain with outstanding views. Avoid weekends, it’s a popular shooting area. I’d provide a link, but BLM’s California web site is partly broken as I write this. Great write up! 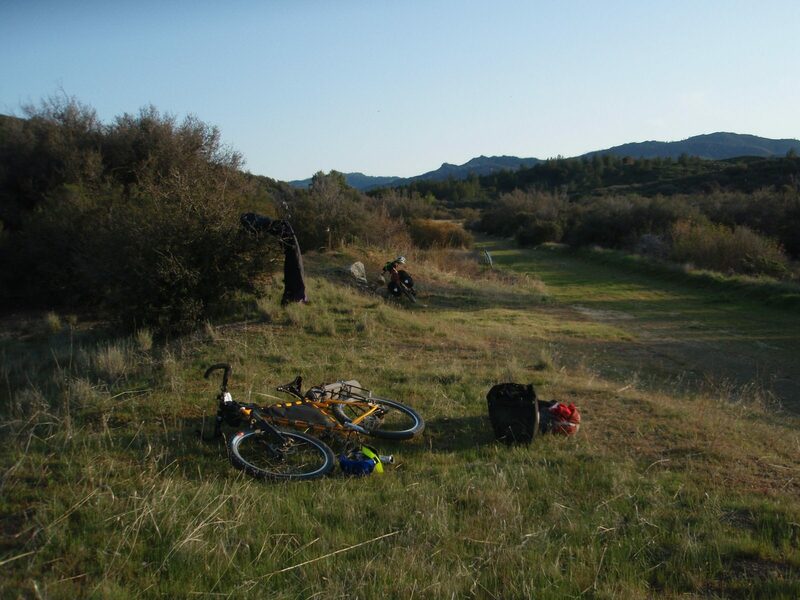 I’m thinking of mtb rike from Arroyo Seca to Escondido roundtrip. USFS said its about 18 miles each way, can you confirm? In the future I Am going to put together some loop road bike routes based on your ride East of King City seems like you didn’t get a lot of traffic. Inspiring trip makes me want to get out there more! 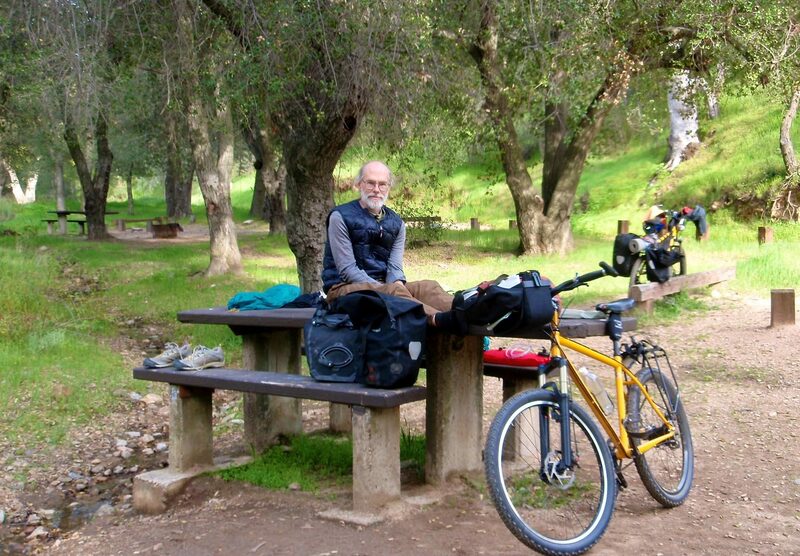 Joel, Good luck with your ride on from Arroyo Seco Campground to Escondido Campground. I just checked using Google Maps on the walking distance between the two campgrounds, and it reports 14.6 miles. You might want to use your favorite mapping tool (our favorite is CalTopo.com) to see what it reports.